One should always pay attention to the sayings of James Bond villains. 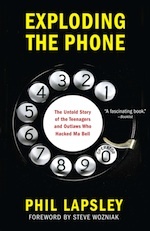 So I took notice when three separate phone phreaks I interviewed mentioned Edward Thorp’s 1962 book Beat the Dealer. For many years Beat the Dealer was the Bible of Blackjack: a perfectly legal system for beating the game of 21 that didn’t even require card counting. (if you were willing to count cards, also perfectly legal, Thorp described in detail a system in which you could do even better.) Beat the Dealer was based on calculations of blackjack probabilities that were made using MIT’s IBM 704 computer. The phone phreaks who mentioned this book said it had a strong influence on them. Perhaps this should come as no surprise. Hackers and phone phreaks often can’t help themselves when it comes to figuring out how to beat systems. It’s in their nature. Computer systems, telephone systems, gambling systems, they're all the same – just another great big intellectual challenge. They're after the dopamine hit you get from cracking a code or solving a puzzle; that and bragging rights. In the late 50s and early 60s when Thorp was an undergrad at UCLA and grad student at MIT he was obsessed with using both brains and technology to hack gambling. While at MIT he talked Claude Shannon, an MIT professor and the father of information theory, into working with him to build a wearable 12-transistor analog computer to beat Vegas by predicting the outcome of roulette. Let me say that again in case you missed it, because I find it audacious and stunning to this day: he and Claude Shannon built a 12-transistor wearable analog computer to beat Vegas by predicting the outcome of roulette. In 1960. This little gem used toe switches hidden in your shoes to input the timing of the ball and the wheel. As output it used a tiny ear phone and one of eight tones to communicate its prediction of which one-eighth of the roulette wheel the ball should land in. Its expected return over the long run was +44%. You can read Thorp's own brief account of it here, it’s fascinating. Thorp’s work on roulette became public in 1966. Other groups built on it. One at the University of California at Santa Cruz spent years building an 8-bit wearable digital computer for predicting roulette. Their saga was chronicled in Thomas Bass’s 1985 book The Eudaemonic Pie. Others applied digital technology to wearable blackjack computers; I had one demonstrated to me by a former phone phreak in my living room a few years ago. You can still buy them, too, or just read about their development history. You can't use them, though, at least not legally in Nevada: Thorp says that in 1985 the Nevada state legislature passed a law banning the use of wearable computers for gambling.